In light of a study published in BMC Medicine, authors Nancy Fullman and Alexandra Wollum take a deeper dive into Nigeria’s gains against polio and what they could mean for the country’s routine vaccine systems. Why are these two events so significant? Even as recently as 2012, many viewed Nigeria’s polio elimination aims as a losing battle, an overly ambitious goal for a place where polio vaccination efforts have often faced an uphill battle of boycotts and violence. Nigeria has taken on these challenges, with support from organizations like the Global Polio Eradication Initiative (GPEI), to build stronger disease surveillance systems and revamp targeted immunization campaigns to deliver vaccines at roadside checkpoints in areas where Boko Haram is active. And these investments seem to be paying off, according to new state-level results from the Institute for Health Metrics and Evaluation (IHME). 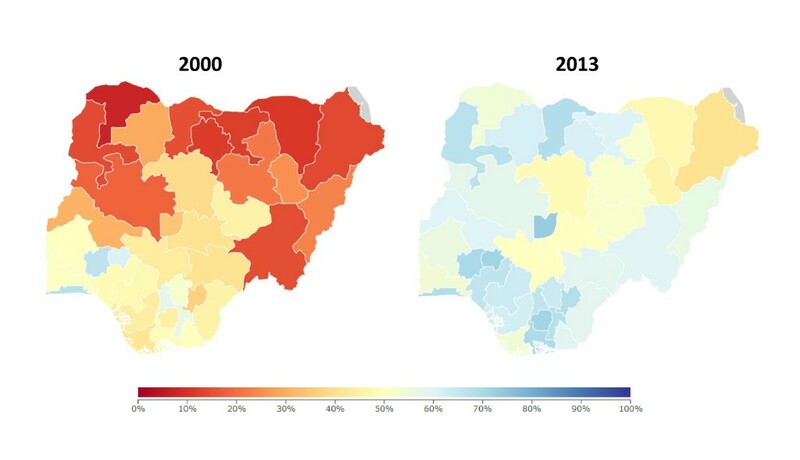 Between 2000 and 2013, Nigeria’s polio immunization landscape notably improved, as highlighted by IHME’s interactive data visualization tool, Nigeria Health Map. In fact, a number of northern states, where Nigeria’s polio burden has been highest historically, saw immunization rates more than double during this time. These improvements were largely driven by widespread campaigns, often door-to-door, delivering the oral polio vaccine (OPV) to children throughout the country. Until recently, OPV was the only polio vaccine used in Nigeria, largely due to its high effectiveness, low cost, and ease of administration and storage. Nonetheless, OPV carries a small risk of causing vaccine-associated cases of polio because it is based on a live-attenuated virus (and not an inactive one). This is a significant issue to the world’s goal of eradicating polio; subsequently, the World Health Organization (WHO) has recommended that all countries introduce IPV into their routine immunization schedules. IPV, like many other vaccines, requires proper storage and training for its administration as an injectable vaccine, and thus is typically given at health facilities over the course of multiple visits. When a country’s routine immunization systems are strong, with children regularly accessing the health facilities and completing their vaccine schedules (e.g., receiving three doses of the diphtheria-pertussis-tetanus [DPT3] vaccine), introducing new multi-dose vaccines may be more seamless than in contexts where people have less health system access (and often benefit from door-to-door immunization campaigns, like those used for OPV). In 2013, the coverage gap between OPV3 and DPT3 immunization widened in many states, a red flag for the country’s routine immunization services. As shown in the Nigeria Health Map view below, state coverage rates of OPV3 generally clustered around 60% (shown in blue, on the bottom portion of the graph), whereas DPT3 coverage ranged widely, from nearly 0% to over 80% (shown pinkish color, on the vertical portion of the graph). The states with high levels of both OPV3 and DPT3 (darker purple on the map) in 2013 are those located in more urban, wealthier areas of the country; states for which OPV3 was high but DPT3 coverage was low (blue on the map) are in places where high levels of poverty and violence still grip communities. The latter finding, higher coverage of OPV3 and low rates of DPT3 in many states, echoes a concern of many health leaders in Nigeria and worldwide: routine health services may falter in the wake of heightened disease-specific campaigns. There is no quick fix for strengthening routine services, particularly in a place like Nigeria, where its size and large socioeconomic inequalities pose significant implementation obstacles. Yet an opening has emerged to improve Nigeria’s routine immunization programming, and coincidentally, it comes from the country’s polio endgame. As Nigeria is quickly introducing IPV state-by-state, a host of international partners, ranging from the WHO to Gavi, the Vaccine Alliance, is supporting coordinated efforts to train health personnel in proper vaccine administration and to conduct high-profile media campaigns around receiving IPV at health facilities. This kind of investment in Nigeria’s routine immunization service delivery and outreach efforts is essentially unprecedented. If it’s successful, more children than ever before will be accessing the country’s health system. Introducing new vaccines is never easy, and it’s possible that implementation problems will outnumber potential gains. Nonetheless, it’s an opportunity that neither Nigeria nor development partners should ignore. By phasing out OPV and bringing IPV into its routine immunization system, Nigeria is moving closer to eliminating polio, but the country also has the chance to get more children fully vaccinated; a goal that could save many, many lives. Nancy Fullman is a Policy Translation Specialist at the Institute for the Health Metrics and Evaluation (IHME). Her main interests involve translating research into actionable, policy-relevant materials and engaging stakeholders on the uses of evidence in decision-making. Alexandra Wollum is a Post-Bachelor Fellow at IHME and Masters student at the University of Washington. Her current research focuses on assessing health service delivery and quantifying how different factors affect health system performance.